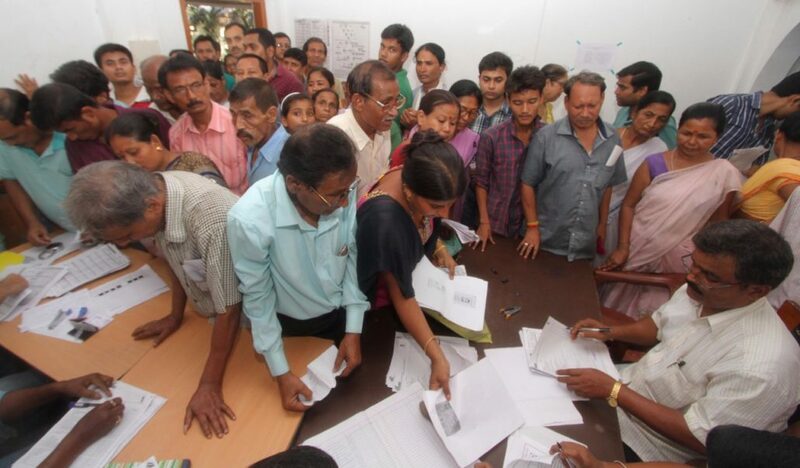 File Photo of people visiting an NRC Seva Kendra to check their names in the final draft NRC. The Forum Against Citizenship Act Amendment Bill (FACAAB), led by noted intellectual Hiren Gohain and the 11-party Left-Democratic Manch, Assam has moved the National Register of Citizens (NRC) authority appealing that fresh marking of ‘D’ voters (doubtful voters) and references of such cases to the foreigners’ tribunals (FTs) should be stopped while the update process of the NRC is on. A report published in the The Times of India stated that while sending a memorandum to the State coordinator of the NRC and a copy of it to the Registrar of the Supreme Court on Tuesday, the two organisations said the final NRC will automatically set aside genuine Indian citizens. “It is the considered opinion of the two platforms- the Left-Democratic Mancha, Assam and the FACAAB – that fresh marking of ‘D’ voters and references of such cases to the tribunals while the update process is on, should be stopped at least till the publication of the final draft. The NRC update is also a legal process and is being monitored by the country’s highest judiciary and documents of the applicants are being screened thoroughly,” said the memorandum. The report further stated that when some people went to the seva kendras to inquire about the reasons for the exclusion of their names, they were informed that they were marked ‘D’ voters and so their names were dropped. “These so-called ‘D’ voters never knew that they were ‘D’ voters or their cases were referred to the tribunals. They have been enjoying the right to franchise and even cast their votes in the 2016 Assembly election without being notified as ‘D’ voters,” said the memorandum. They said many migration certificates issued in 1964-65 were also rejected. “This would certainly be a great injustice to the people who have migrated and settled in Assam or elsewhere in the country before March 24, 1971 with valid documents,” said the memorandum. “The names of a large number of people belonging to different castes, communities and ethnic groups were found missing although they submitted proper legacy data and all other relevant documents. There are also reports of large-scale exclusion of names belonging to both religious and linguistic minorities in some places,” it further added.